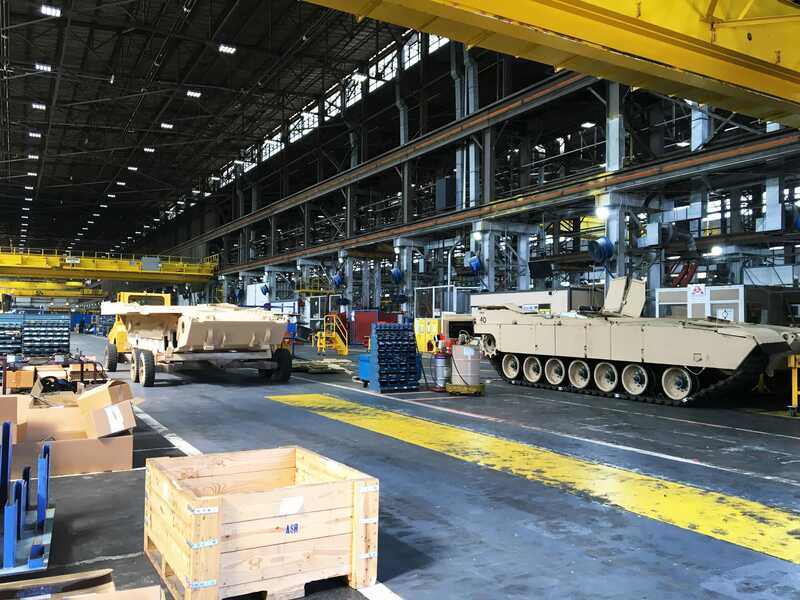 Amanda Macias/Business InsiderA repaired Marine Corps M1A1 rolls out of a storage facility to a nearby test track at Anniston Army Depot. ANNISTON ARMY DEPOT, Alabama — Used in nearly every major US conflict since its introduction in 1980, America’s mighty M1 Abrams serves as the principal battle tank of the Army and Marine Corps. At close to 70 tons, the stalwart M1A1 Abrams is among the heaviest tanks in the world, but makes up for its weight with exceptional firepower and unnerving manoeuvrability. 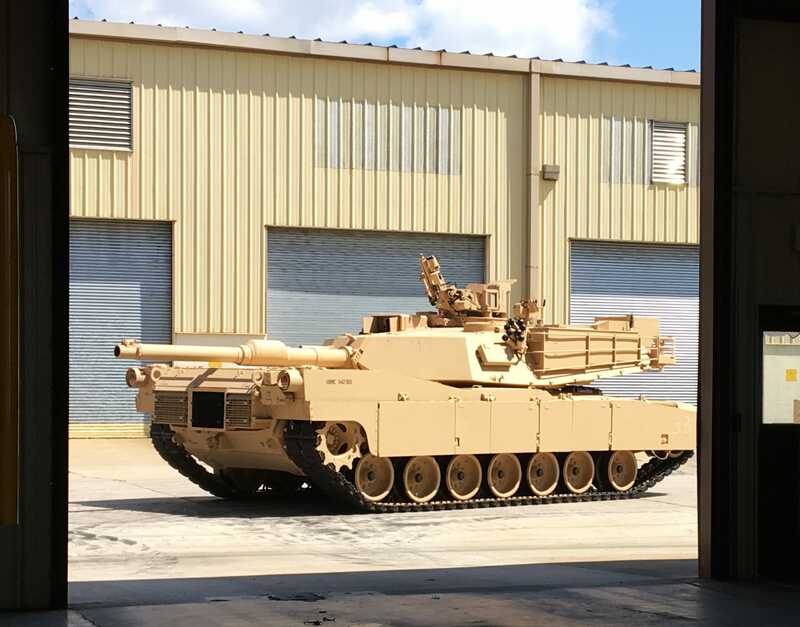 Today, the Abrams has three variants — M1, M1A1 and M1A2 — thanks to upgrades and modifications overhauled at Anniston Army Depot, a maintenance and munitions-storage site nestled in the foothills of the Appalachian Mountains. Amanda Macias/Business InsiderCombat vehicles sit inside one of Anniston Army Depot’s repair facilities. Motioning for me to walk to the back of a turret-less Marine Corps M1A1, a logistics specialist at the installation named Larry Phillips pointed to what he called a “TIP,” or tank infantry phone — aka grunt phone. 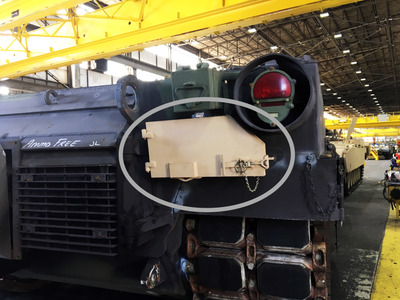 Secured to the rear of the hull underneath the taillight guard and above the track, the exterior phone housed in a box allows infantry troops to communicate with the tank crew. Amanda Macias/Business InsiderBehold the grunt phone. 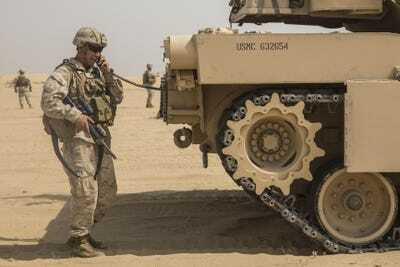 The infantry phone, a frequent request from troops serving in Iraq, was incorporated in the 2006 rollout of the Tank Urban Survival Kit (TUSK) system, a series of Abrams modifications intended to improve coordination and survivability in urban environments. Along with the grunt phone, TUSK added a remote weapon station machine gun operated from inside the vehicle, a loader’s armour gun shield, reactive armour tiles fitted to side skirts, a remote thermal sight, and a power distribution box. US Marine CorpsBehold the grunt phone IRL. 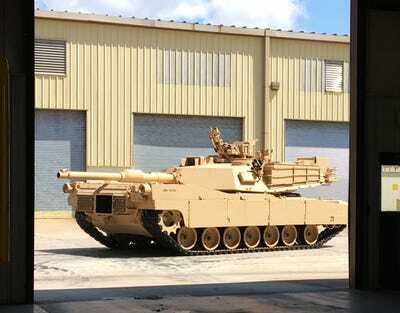 Due to upgrades and improvements such as TUSK, a new Abrams tank has not been built from scratch since 1993.